The cause of the tsunami observed in Chatham Islands in 1924 is still unknown. Run-up for Chatham Islands tsunami. 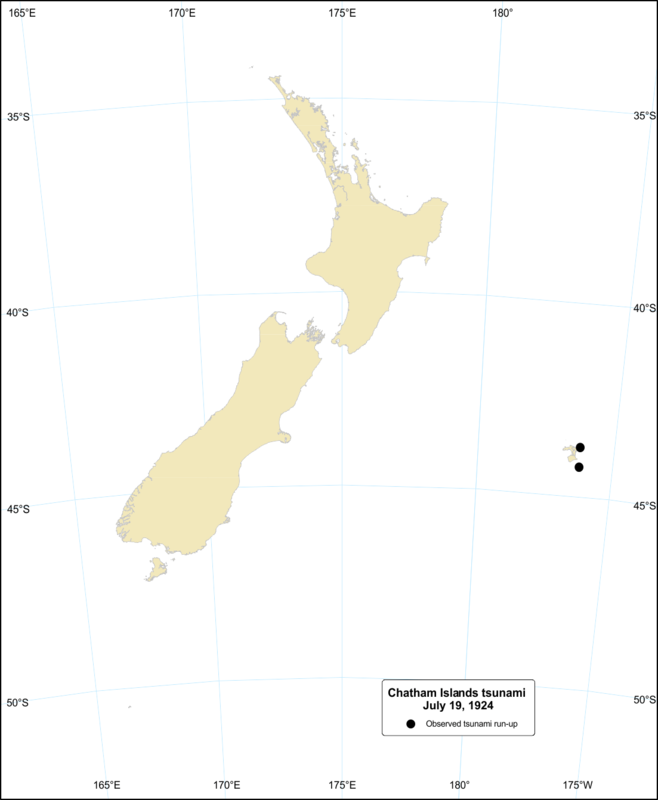 On 19 July 1924 starting at about 7:15 pm (NZMT), a series of waves reaching up to 6m above the high water mark affected a number of locations on the Chatham Islands over a period of just over three hours. Those locations most affected were settlements on the northern and eastern side of Chatham Island, and the settlement on Pitt Island. At Kaingaroa, the waves swept over 100m inland, sweeping away a dam supplying fresh water, one trawler was smashed and another lost. Near Wharekauri, a bridge was badly damaged, fences washed away, and the water washed over Te Awanui island. Several boats were damaged at Owenga, a small hut was washed away and some machinery at the shell-crushing plant damaged. On Pitt Island, the wharf disappeared, two small boats swept up a stream, and beaches eroded of shells. Mangere Island was also affected and a large landslide occurred. The source of the tsunami is still unknown. Two possibilities are that it could have been due to a local coastal/submarine landslide, or an unidentified local or distant earthquake.